The success of the eighth annual Canine Carnival in 2016, combined with great support from sponsors and attendees, and the annual Pucks for Paws at the Syracuse CRUNCH, has ensured that 50 CNY animal welfare organizations receive much needed monies. More than $42,000 has been recently donated, split amongst 50 local animal welfares and rescues. Wayne Mahar thanks each organization for “doing the tough work, day in and day out of caring for our animal friends”. To date nearly $200,000 has been donated to CNY animal rescues and welfares by the Priscilla Mahar Animal Welfare Foundation. Primary sponsors of Canine Carnival include C&S Companies, Wegmans, Liverpool Village Animal Hospital, Veterinary Medical Center of CNY, CNYcentral, GALAXY Communications and Onondaga County Parks. DATE CHANGE! To get out of prime heat and humidity season, beginning with Canine Carnival 2017, the annual Canine Carnival will move to the last Saturday in September. That would be Saturday September 30th this year. The animal welfare organizations receiving donations includes locally the CNY SPCA and Humane Association of CNY with other rescues from the Mohawk Valley, CNY and the Finger Lakes. Anyone interested as a rescue, vendor, sponsor or volunteer, please contact us by email through our web site at www.pmawf.org. Priscilla Mahar Animal Welfare Foundation is a 501(c)3 New York non-profit raising money through annual events to help central New York animal rescue and welfare organizations give our animal friends a second chance. Canine Carnival and Pucks for Paws at the Syracuse CRUNCH in March are the primary fundraising events of the organization. 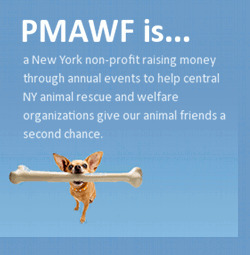 Founded in 2008, PMAWF has now donated nearly $200,000 to fifty animal welfare organizations in the CNY area. Thank You to so many, from sponsors and volunteers to attendees and everybody in-between for your support. See you Saturday September 30th. Canine Carnival, the largest animal rescue event in the northeast, will be changing dates starting next year moving from early August to end the of September. In its seven years of existence, Canine Carnival, although very successful attracting more than 15,000 people, hundreds of animals, rescues and vendors, has faced August heat and humidity issues and the occasional thunderstorm. Wayne Mahar, Founder of Canine Carnival says “Moving to the last weekend of September should allow for greater comfort for all involved from the attendees to the animals, not to mention less chance for thunderstorms”. Canine Carnival 2017 will take place on Saturday September 30th at its usual location, Jamesville Beach Park just minutes from Syracuse. Canine Carnival is the primary fundraising event of the Priscilla Mahar Animal Welfare Foundation, a non profit 501c3 corporation which donates money to central New York animal rescues. To date the Priscilla Mahar Animal Welfare Foundation has donated nearly $135,000 to CNY animal rescue organizations with hundreds of animals finding their forever homes. For questions about Canine Carnival do to www.pmawf.org and contact via email.